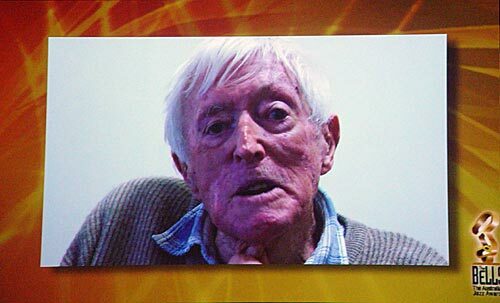 Jazz great Graeme Bell addressed last year’s awards via video. On Thursday next week, May 2, at the Regent Theatre Ballroom, the glitterati of the national jazz scene will gather for the 2013 Australian Jazz Bell Awards. Sadly, Graeme Bell, MBE, AO, after whom these awards are named, died last year, so it will be the first ceremony without him. One of the most respected Australian jazz musicians, Bell was unable to attend the 2012 awards night, but addressed the gathering via a video link. This year’s ceremony will feature a special tribute to this talented artist. Hard-working and talented musicians often struggle to find the money to record and release their work, so the $5000 prizes in each category of these awards can make a huge difference. A Bell Award also looks pretty good on a musician’s CV. No attempt to rate musicians’ work will satisfy everyone, but the 2013 Bell Awards judging panel is a talented bunch of luminaries, drawn from Australia and overseas, who are closely associated with improvised music. They are Adrian Jackson, Albert Dadon, Gerry Koster, Laurence Donohue-Greene, Martin Jackson, Michael Tortoni, John McBeath and Rob Burke. The awards recognise and encourage excellence in the performance, creativity, recording and presentation of jazz in Australia. Winners of the 2012 Australian Jazz Bell Awards. This entry was posted in ARTICLES and tagged 2013 Australian Jazz Bell Awards, Adrian Jackson, Albert Dadon, Australian Jazz Bell Awards, Best Australian Contemporary Jazz Album, Best Australian Jazz Song of the Year, Best Australian Jazz Vocal Album, Best Australian Traditional Jazz Album, Gerry Koster, Graeme Bell, John McBeath, Laurence Donohue-Greene, Martin Jackson, Michael Tortoni, Most Original Australian Jazz Album, Regent Theatre Ballroom, Rob Burke, Young Australian Jazz Artist of the Year. Bookmark the permalink.